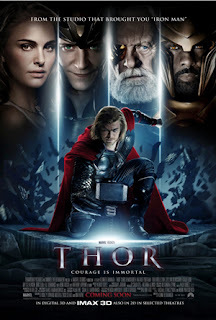 Compared to Fast Five’s April Box Office record last week ($86.2 million), Thor opens to a slightly underwhelming $66 million. It is wild when we can say that earning $66 million is underperforming, but for the superhero film officially opening the summer movie season, I think everyone expected more. 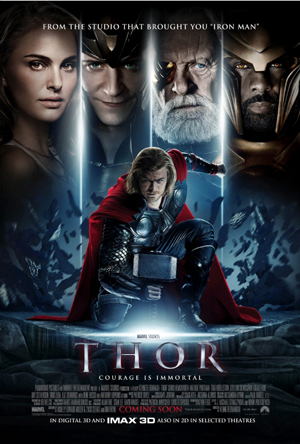 According to Box Office Mojo, the 3-D sites accounted for 60% of the total take for Thor. It is wild to see the near 50/50 split for those still choosing the 2-D option. Although I don’t know how many areas only had access to 2-D, which may have skewed these results. None the less, next weekend will be tough to call. Priest 3-D is opening with a load of advertising at its back, but it generally seems to have more of a SyFy movie feel than a summer blockbuster. Maybe I’m wrong and it will be a pleasant surprise, but I think it is going to get crushed. The big ticket for next week should be the (hopefully) hilarious Bridesmaids, aka Lady Hangover. I think it will be hilarious, but it is going to take a fair amount of pressure from both Thor and Fast Five. Next weekend is going to be very difficult for picks and I think the top five will be something of a crap shoot. As to this weekend…We had a record number of entrants into the BOX OFFICE CHALLENGE. FOUR. Yes, four people chose to roll the dice….well three if you don’t count me! Kenfu and I tied with 11 points and Justin and Detective Guy tied for second with 7 points. Excellent to have you all playing. Folks, spread the word…I’d like to build this into a real game, with real prizes. While they may be humble in the beginning, I plan on throwing another Oscar pool next year, which as always, will be free to enter. I hope to give some teeth to the prizes for the Oscar pool, but if you want to be savvy next year for that, play the challenge each week to keep your box office and film skills sharp!